The stage of the London Coliseum was on a vast scale; 55' wide by 92' deep, and was fitted out with a giant revolve, at a cost of £70,000, a vast sum at the time. It had three concentric rings which could all be operated independently and in both directions. This was the first revolve of its kind to be fitted into a British Theatre, although the London Palladium would later have one too, although sadly this was removed some years ago just as the Coliseum's was when the rest of the Theatre was restored to its former glory in the year 2000. 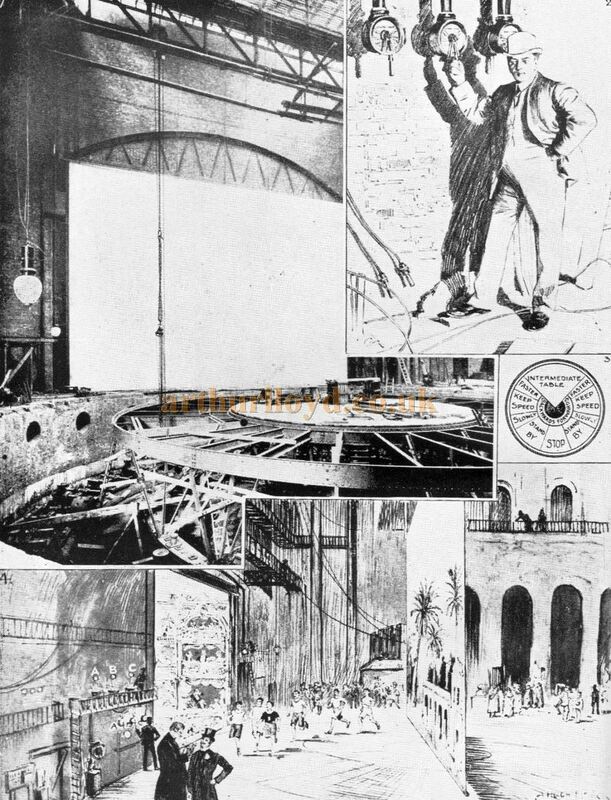 The Building News and Engineering Journal reported on the London Coliseum's Revolve in their December the 9th 1904 edition which I have transcribed below, along with some contemporary images for illustration. 'The engineering works at the London Coliseum were inspected on Saturday by the Junior Institution of Engineers, when a demonstration of the revolving stage was given. As there is no similar arrangement of stage in the world, the details had to be worked out entirely without a guide or any similar apparatus or mechanism as a basis, and from the magnitude of the tables no experiments before placing the contracts were possible. 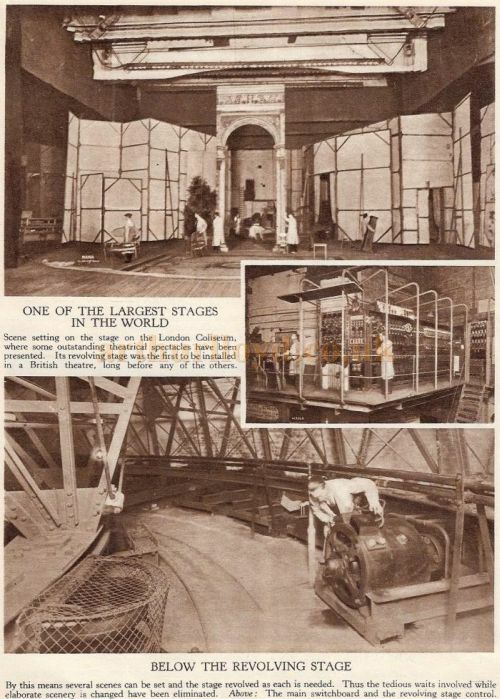 Right - An article about the revolving stage at the London Coliseum from the 1930s - Courtesy Roger Fox who says 'Apart from the revolve it shows what I think is the cyclorama cloth raised up so that sets can be moved beneath. The cone for this cyclorama was put into store at the time of the recent renovation works. It was installed for White Horse Inn and supplied from Germany by the company which is now SBS of Dresden. There are three concentric rings, or stages, the outer one and the intermediate being 12ft. across, and the middle circle 25ft. 7in. The entire diameter across the three is 75ft., and so accurate has been the building up that only 1in. of clearance was necessary to permit of the tables running separately, without rubbing or touching. The tables are built up on rolled steel underframes 9ft. high, and, instead of the motive power and wheels being on the carriages as in a tramway, the engineer has designed a run-way on the underframes, which runs on the motors, thereby reversing the usual order of things and securing considerable lightness, absence of moving contacts for the current, and a great reduction in the noise. The rings or stages can run in either direction as separate pieces, or can be locked together for combined effects. The top staging for actual use is constructed of 2½in. teak, and is screwed to the underframe with a layer of compressed felt between the surfaces. 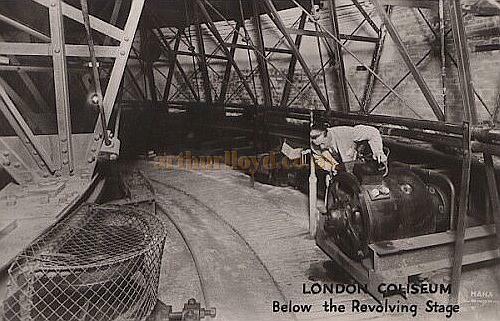 Left - Below the revolving stage at The London Coliseum - From a Postcard. The electric motors, 14 in all, used for driving the stages are all set on adjustable beds for levelling up to the level of the fixed, or permanent, stage surrounding three outer rings, and the motors are all controlled from the special switch pillars on a raised gallery on the prompt side of the stage which overlooks every part of it. The signalling to the drivers is effected by means of a special form of ship's engine-room telegraph worked from a position on the stage level, where the stage manager has also to hand speaking-tubes, lamp signal keys, and telephones to all the points where engineers are stationed to work the numerous electric apparatus. ...To work in conjunction with the revolving stages, and for the proper representation of moving objects and other purposes, it is necessary that panorama on a large scale should be used. There are now installed eight panoramas and a cyclorama. In addition to the ordinary panorama there is also one that will carry people or built scenery and properties. 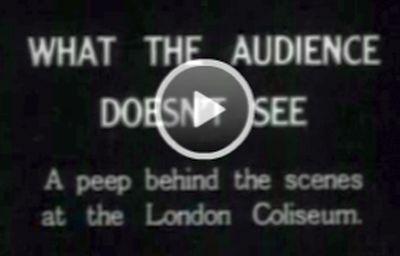 Right - This British Pathe Film from 1926 entitled 'What The Audience Doesn't See' shows the workings of the London Coliseum Revolve, Lighting Switchboard, and the Stage Crew setting a scene - Click to view. All these devices are electrically driven and controlled, but can in an emergency be worked by hand to prevent a breakdown. When complete there will be 30 electric motors at work on the building. The weight of the revolving stages is 160 tons, of which 79 tons represent the weight of the steel underframes carrying the stages. For lighting there was used throughout fireproof cables, an earthed steel tube conduit system. The main stage switchboard has 85 distinct working switches, which are so combined that by interlocking and automatic releasing it is possible for one man to control all the lights on the stage and produce combinations of colours at any strength. All the electrical and mechanical details have been worked out by Mr. K. Wingfield Bowles. 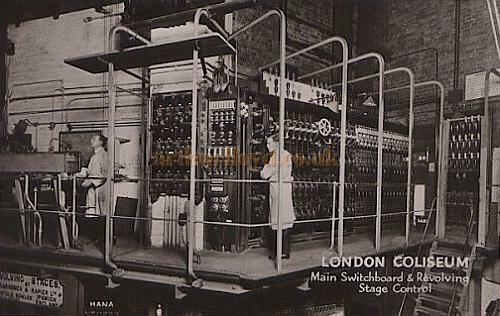 Left - The Lighting Switchboard and Revolve Control at The London Coliseum - From a Postcard. The above text in quotes was first published in the Building News and Engineering Journal, 9th of December 1904.